Let me count the ways I love my Lodge cast-iron skillet. Durability, quality, versatility. Yes. Yes. Yes. Olde-timey appeal? Got it in spades. It's the ultimate All-American cooking vessel. Every cook should have one or two of these. I really do use it for nearly everything. They hold heat evenly and stay hot for a long time. Bake, fry, saute, sear. I use mine on the stovetop and in the oven--they are ideal for everything from pancakes to roasted chicken to apple pie. This one comes "pre-seasoned," which, from what I understand, is the equivalent of using it like 20 or so times. So you get a head start on seasoning, so to speak. That didn't stop me from cooking plenty of bacon in mine to further season it. But, then again, I'll look for any reason to cook a lot of bacon, really. 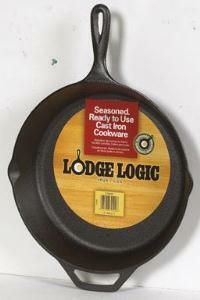 As for the Lodge brand, I think they are still the leader in good ol' American cast iron cookware. They are inexpensive, and they last for decades. I've had mine for years and it is jet-black from seasoning. I went to an esteemed local restaurant the other night and I had an amazing chicken dish that the chef prepares in his grandmother's passed-down cast iron skillet. Now that's home-style cooking. I love how these cast-iron pans get passed along through families. My "griddle," as I affectionately refer to it, will surely be used in my own daughter's kitchen someday.